Periodicals were an integral part of eighteenth-century European civilisation. This volume brings together original articles in English and French dealing with the press both in the main centres of Enlightenment thought and in such often-neglected countries as Portugal and Sweden. The contributions span the long eighteenth century, from Germany in the 1690s to Britain in the post-Napoleonic era. They cover the full range of the period’s press, including manuscript newsletters, political gazettes, learned journals and revolutionary propaganda sheets. João Lisboa and Marie-Christine Skuncke show how periodicals allowed the circulation of news and political criticism even in societies such as Portugal and Sweden, where audiences were limited and censorship was severe; Anne-Marie Mercier-Faivre’s study of press coverage of the Ottoman Empire shows that news reports gave a picture of ‘oriental despotism’ very different from the literary construct of Montesquieu’s Lettres persanes; Bernadette Fort’s essay on art criticism and Martin Stuber’s analysis of the correspondence of a learned journal’s editor broaden our understanding of the place of periodicals in the period’s high culture. The revolutionary era brought major innovations in the press although, as Maria Lúcia Pallares-Burke shows, older genres such as the ‘spectator’ were adapted to the new conditions. Political radicals like Jacques Roux (the focus of Eric Négrel’s study) and the German émigré journalists who had fled to France (examined in Susanne Lachenicht’s essay) owed their careers to the press. But the press could also serve conservative ends, as Philip Harling demonstrates in his analysis of Tory journalism in England in the early nineteenth century. 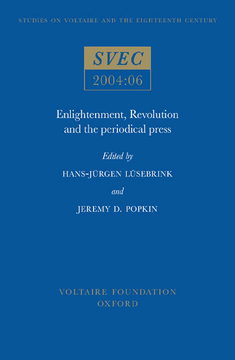 Placed within a broader theoretical and historical context by Hans-Jürgen Lüsebrink, Jack Censer and Jeremy Popkin, these studies expand our picture of the role of periodicals in the age of Enlightenment and Revolution, and suggest important new directions for further research.